A new report from the National Academies of Sciences, Engineering, and Medicine highlights the dynamic process of learning throughout the life span and identifies frontiers in which more research is needed to pursue an even deeper understanding of human learning. "The body of research on learning shows how complex it is, and how many different elements interact as people learn," said Cora Bagley Marrett, former deputy director of the National Science Foundation, professor emeritus at the University of Wisconsin-Madison, and chair of the committee that conducted the National Academies' study. "The report explains that people learn every day, in different settings and in different ways. Some forms of learning happen intentionally while others happen with little effort, such as when people learn everyday processes such as cooking. People do not simply collect memories, knowledge, and skills in a linear fashion, but through myriad processes that interact over time to influence the way they make sense of the world." Learning is an ongoing process that is simultaneously biological and cultural. Each individual learner functions within a complex developmental, cognitive, physical, social, and cultural system. Learning also changes the brain throughout the life span. At the same time, the brain develops in ways that impact learning and are in turn shaped by the learner's context and cultural influences. The report goes on to say that factors that are relevant to learning include influences from the microscopic level to the characteristics of the learner's neighborhood, community, and the time period in which he or she lives. Even at the most basic level, evidence shows that brain development and cognition are guided and organized by cultural, social, emotional, and physiological experiences that contribute to both age-related and individual variability in learning. In 2000, a National Academies report brought together decades of research on the processes and functions of learning in "How People Learn: Brain, Mind, Experience, and School (HPL I)." The report summarized the work of two committees that had examined insights on the nature of learning between kindergarten and grade 12, such as how experts differ from novices, how learning transfers across settings, and how children and adult learners do and do not differ. It described principles for the design of effective learning environments, offered examples of effective teaching in history, mathematics, and science, and examined the extent to which opportunities for teacher learning enhance effectiveness in facilitating student learning. 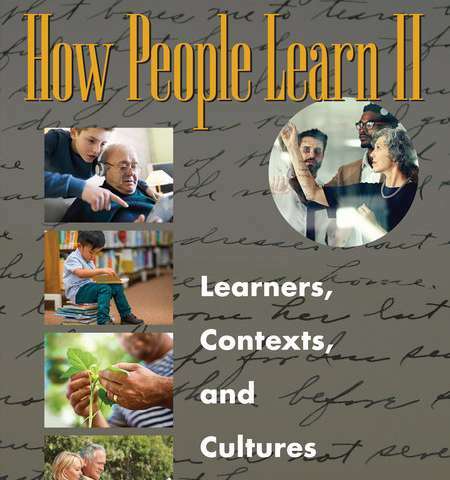 "How People Learn II: Learners, Contexts, and Cultures" summarizes new insights related to the ground covered in HPL I and expands the discussion to include learning that occurs beyond K-12 education to encompass the entire life span. "The foundational research that was documented in HPL I holds true today, but after nearly two decades, an examination of new research was needed," said Marrett. "How People Learn II provides a much-needed update." The report says that understanding the developmental, cultural, contextual, and historical diversity of learners is central to understanding how people learn. An individual's learning and development are affected by the environment in which he or she lives – including not only the family and other close relationships and circumstances but also the larger context in which families and communities are situated. Researchers have explored how cultural values, historical perspectives, modes of communication, and the importance attached to different kinds of knowledge and skill affect learning. To learn intentionally, people must want to learn and must see the value in accomplishing what is being asked of them. The committee found that numerous factors and circumstances sway an individual's desire to learn and the decision to expend effort on learning. The report concludes that motivation to learn is influenced by the multiple goals that individuals construct for themselves as result of their life and school experiences and the socio-cultural context in which learning takes place. Motivation to learn is fostered for learners of all ages when they perceive that the school or learning environment is a place where they "belong" and when the environment promotes their sense of purpose.